Nothing sets the scene for your holiday dinner like a beautiful vase of flowers. This Hexagon Tulip Vase helps you take your flower game up a notch with a unique tulip shape with fabrics selected to match the holiday decor. It’s also the perfect way to bring flowers as a hostess gift, leaving your handmade vase behind for the recipient to enjoy again and again even after the flowers are gone. 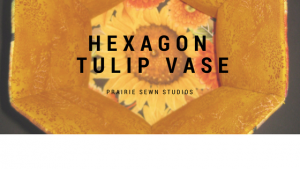 To make the Hexagon Based Tulip Vase (try saying that 3 times fast!) you’ll need a copy of our book, Contain It! English Paper-Pieced Accessories. You’ll need use the templates in the book for the side and inner base pieces, and for the extensive directions for construction. The new outer base template is below. In addition to using some of the templates from Contain It! to make this vase, the book will also serve as the full set of instructions for prepping the materials and constructing the vase. 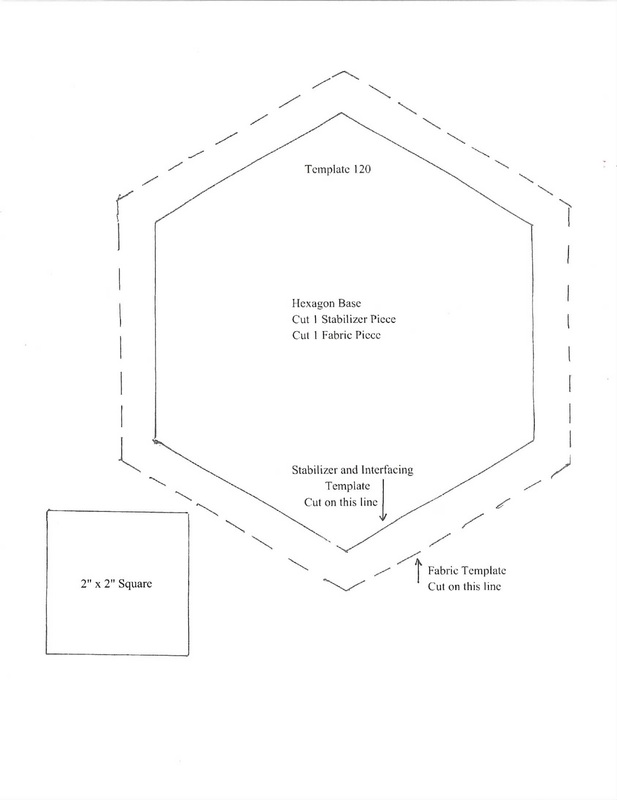 Here is the basic outline of the steps, but be sure to also read the instructions for the Medium Concave Vase starting on page 35, as this new vase can be assembled following the same steps. You can do some really nifty things with the large size of the hexagon base. 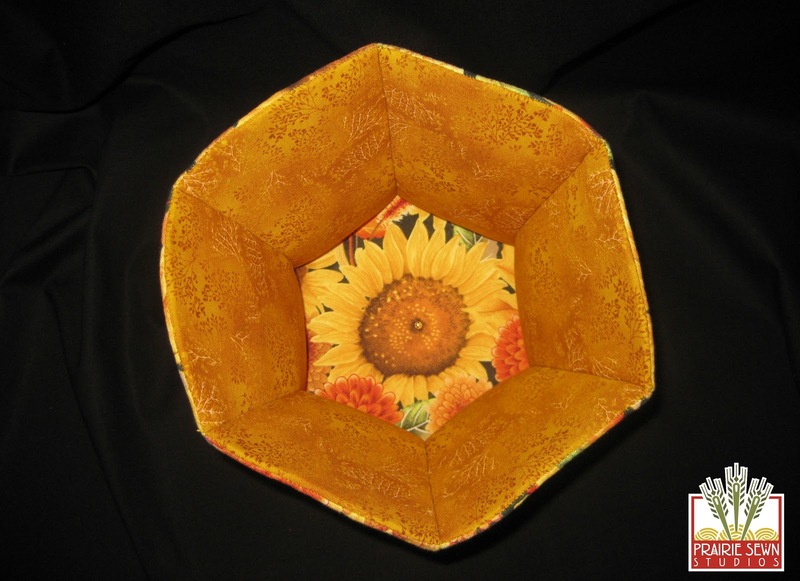 It’s the perfect place to add a surprise focus fabric or other fussy-cut design, like with this beautiful sunflower fabric. 1. Gather the supplies listed above and review the basic container instructions in Contain It! starting on page 9. 2. Make your template pieces and cut the following pieces. Don’t be fooled by the similarity of the two hexagon bases in the book. This new vase has slightly different dimensions, so be sure to follow the cutting and labeling instructions exactly as provided here. As always, be sure to label everything! 3. Using Template 120 that you printed, cut the following pieces. Remember to use the 2″x2″ square on Template 120 to ensure your pattern printed at the correct size. Click here for a printable PDF of Template 120.
Review the detailed directions on pages 9-16 with any questions. If you want to make sure the Octopus looks right, take a peek at the Concave Vase with a Hexagon Base diagram on page 42. 5. Decide what you’ll do with your new vase! Keep it for yourself? Or give it as a hostess gift when you attend Thanksgiving or another holiday party? Either way, be sure to post your pictures on the Prairie Sewn Studios Facebook Page or email them to us at contact@PrairieSewnStudios.com.